Four men have been jailed after a man was stabbed to death in a Manchester street. 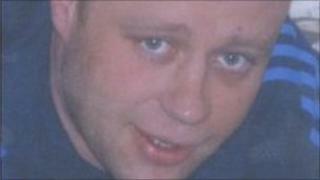 Karl Hodson, 31, was found by police in Harold Priestnall Close, Newton Heath, on 23 March. He died in hospital shortly afterwards. Jamie Smith, 27, of Petrock Walk, Newton Heath admitted murdering Mr Hodson and was jailed for life at Manchester Crown Court on Monday. Three other men admitted conspiracy to commit grievous bodily harm. Smith must serve a minimum term of 23 years and six months. Thomas Fitzgerald, 28, of Halliday Road, Newton Heath, was jailed for nine years and four months. Karl Souter, 28, of Argyll Road in Chadderton, Oldham, was sentenced to four years and six months in prison. Lucas Lavelle, 23, of Surbiton Road, Newton Heath, was jailed four years and four months. Police said the group went to Mr Hodson's house after a disagreement between him and Fitzgerald. They dragged Mr Hodson from his house and Fitzgerald hit attacked him with a hammer and Smith stabbed him. He was found unconscious in the hallway of the house. Det Sgt John Mulvihill, of Greater Manchester Police, said: "This was a pre-planned attack by men armed with weapons. "Karl's mother had to deal with seeing her beloved son taking his last breaths as he lay dying in her hallway. That gruesome memory will haunt Mrs Hodson for life."